Pretty good show. You can download it on bit torrrent for the high quality version. Why they did progress further, just put two miniturbofans in it to see how it flies. Do you seriously think they would want a replica of the father of the B2 to actually be seen in flight???? They've strived for decades to make certain the public at large forgot the Go229 ever existed. See the Go229 in flight, and it's direct relationship to the B2 becomes screamingly obvious, which also accounts for why the original relic is still rotting away and unrestored after 6 decades. Last edited by Uyraell; 01-31-2010 at 01:24 PM. Reason: Typo. There are a few French gliders (sailplanes) from the 1960s that are designed just like that... Nobody stopped them from flying, they just weren't very good so didn't sell well. I would suspect the lack of a stabilizer was the reason. To keep the aircraft going in the same direction needs either a stabilizer (tail fin) or very very good controls in the wings. It can be done now quite will due to computers (as the B2 and F117 shows) but back then some form of dual ailerons that open like dive breaks and keep the plane on course. It would have taken a very delicate set of hands to do that with the technology back then and still have a maneuverable fighter. So I bet the 229 was a very difficult plane to nanuver. Wonder if a radio controled model could be easily built? Anyone in that hobby available to comment? It can be done now quite will due to computers (as the B2 and F117 shows) but back then some form of dual ailerons that open like dive breaks and keep the plane on course. It would have taken a very delicate set of hands to do that with the technology back then and still have a manoeuverable fighter. So I bet the 229 was a very difficult plane to manoeuver. That's the unusual aspect of the Horten aircraft, Deaf. They were controlled by various forms of spoiler/airbrake-bar in the wing, hence had no need for vertical surfaces. Nor was any form of computer assistance available or needed. It is precisely that lack of vertical surfaces that distinguishes between the Horten designs and those of Jack Northrop, which is why the B2 is plainly a child of Horten designs, despite claims to the contrary. As for manoeuverability, everything I've read says their handling was excellent, and trouble-free. Granted, I have some personal reservations regarding stall-departure angles at high angels of attack, or at high indicated airspeed, but I'm not a qualified pilot, so am only going by the theory I was taught by experienced pilots, as far as the a-o-a-stall-depart-recover topic goes. Last edited by Uyraell; 02-01-2010 at 01:56 PM. Reason: Typo. Thats a coffee brand right? But seriously, they only rebuilt this plane to test it for it's radar cross-section using ww2 era radars. They thought that the germans tried to make a stealth plane. The odd part was, the Germans discovered it only gave about 30% of the radar return it was predicted to. Granted, by todays standards, it would still remain detectable, however: with the equipment available in 1944-45 it would have been somewhat more problematic, and much less radar-visible. 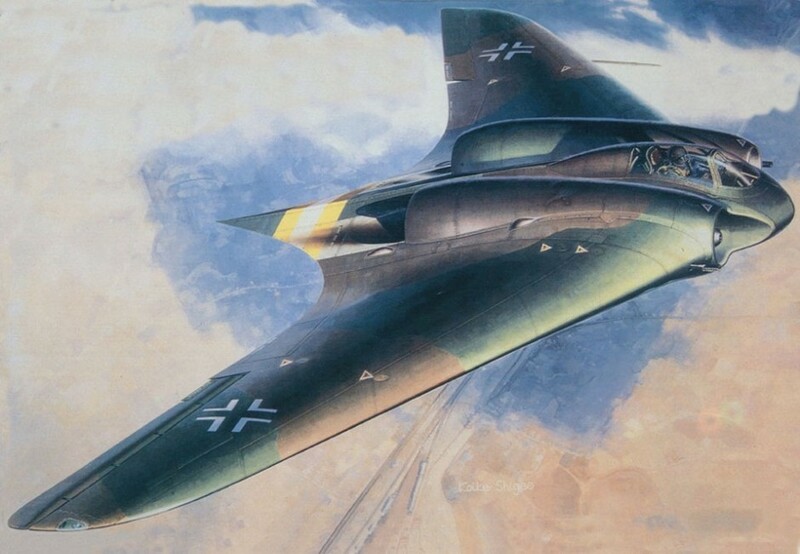 The Nat_Geo link also mentions that the Germans had applied a primitive form of radar-absorbent coating to the original Horten 229/Gotha 229 in storage at the Paul Garber Facility to this day. Last edited by Uyraell; 02-06-2010 at 09:46 PM. Reason: Typo.